CD review: "Fourth and Beale"
This review first appeared in the January 29, 1993 issue of the North County Blade-Citizen (now North County Times). 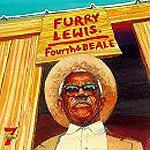 The late Furry Lewis was one of the pioneers of both the blues itself (having been born before the turn of the century and raised up as the blues was developing out of spirituals and field hollers) and Memphis as a center of american music. This album, recorded in 1969 and re-released now on CD, is a snapshot of American rural acoustic blues, with plenty of asides giving context from Lewis' own memory. Singing songs such as "John Henry," "When the Saints Go Marching Home" and "St. Louis Blues," along with many of his own originals, Lewis' performance here preserves a slice of blues history for posterity.